Sunset Captions for Instagram: Are you looking for a caption for sunset? 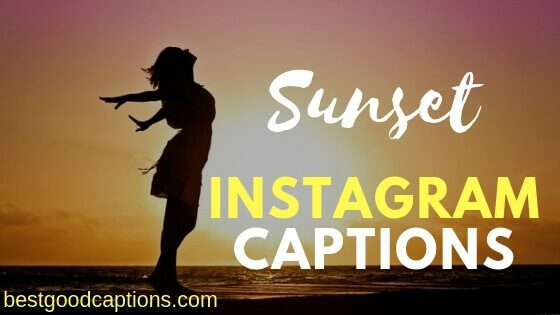 You have finally made the perfect selfie picture of sunset for Instagram and want to add a perfect image caption with your Instagram post. But you are not aware caption about sunset. Then look no further as we have collected massive collection of 110+ sunset Instagram captions. Sunsets are one of the beautiful and most amazing things one can ever fill in his lifetime. If you are a sunset lover then you must have the bounty of sunset selfies and pictures with family enjoying the sunset. And if you are thinking to post your selfies on Instagram, then you need some funny, good and clever sunset picture captions. Whether you live in the city, the country, or on the beach, or in the apartment you can always see sunset and sunrise every day. When you take video or picture and want to share on Instagram, you want to create some meaningful caption along with the picture. 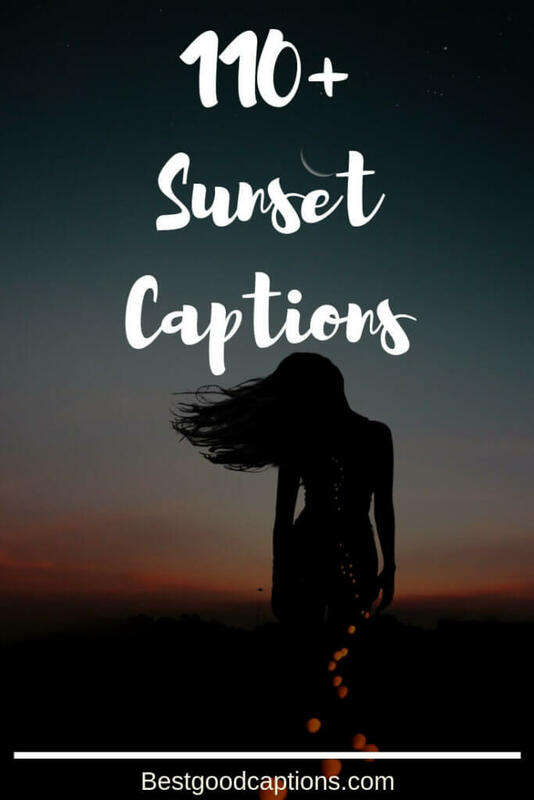 Here is an awesome collection of captions for sunsets. We have also share beach Instagram captions. 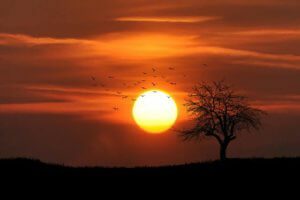 If you are looking for amazing sunset Instagram captions then this is the article where you will get awesome collection of captions for your sunset photos. Born to chase oranges, yellows, and blues. Cloudy days make gorgeous reds. Are twin brothers called sunsets? I live for sunsets with you. Autumn is a sunset around every corner. That crazy little sun of a beach. The brightest day of the week is Sun-day. Every sunset is an opportunity to restart your life. Every sunset brings the promise of a new dawn. Sunsets are just little glimpses of the Golden streets of Heaven….. Many things in life can wait, but the sunset won’t, watch it. Reading while sunbathing makes you well-red. Even the sun sets in paradise. A sunrise and sunset reminds us of new beginnings and the hope of a better tomorrow. Sunsets are like God’s paintings in the sky. Nothing like a Smoky Mountain sunset. Every sunset is an opportunity to reset. To view a sunset from above the trees is to find heaven. Stay strong, after every sunrise comes a sunset. A real sunset is an explosion behind a mountain silhouette. There are too many things I haven’t done yet. There are too many sunsets I haven’t seen. Sunsets are proof that endings can often be beautiful too. I climb mountains so I can see where the sun sleeps. Sunset is still my favorite color, and the rainbow is second. A promise of a new tomorrow. Don’t waste sunrises on people who will be gone by sunset. Meet me where the sky touches the sea. The whisper of the dusk is night shedding its husk. The sun loved the moon so much that he died every night just to let her breath. The most beautiful sunsets are the ones we share. Beyond the sundown is tomorrow’s wisdom, today is going to be long, long ago. Clouds come floating into my life, no longer to carry rain or usher storm but to add color to my sunset sky. Ride off into your sunset. I never met a sunset I didn’t like. When the sun has set, no candle can replace it. Live by the sun. Love by the moon. Don’t forget, beautiful sunsets need cloudy skies. Sunsets are one thing in life that won’t wait. A sunset is the sun’s fiery kiss to the night. The sun is saying goodnight. If I could lick the sunset, I’ll bet it would taste like Neapolitan ice cream. Mother nature doesn’t need a filter. City lights got nothin’ on country nights. Sunsets are cliche for a reason. Can you see the sunset real good on the Westside? You can see it on the Eastside too. Appreciate small moments of happiness, for they are so important. Everything gets hotter when the sun goes down. If the sun never set, we’d never have the gift of a new day. At the end of the world the sunset is like a child smashing a pack of crayons into God’s face. The only kind of sunsets that I don’t like are the ones that I missed. Okay Mother Nature, you win. When the sun comes up, I have morals again. I find my happiness where the sun shines. I can’t give you the sunset, but I can give you the night. For a minute there, I lost myself. My favorite color is sunset. Girls just wanna have sun. You are the sun to my shine. The sun is alone but it still shines. The sky broke like an egg into full sunset and the water caught fire. Let’s go somewhere the sun kisses the ocean. If the boy and girl walk off into the sunset hand-in-hand in the last scene, it adds 10 million to the box office. Today, we love cotton candy sunsets. When the skies turn pink it’s time for a drink. It’s going down for real. You are enough to drive a saint to madness or a king to his knees. And in this moment, the world felt still. There are a sunrise and a sunset every single day, and they’re absolutely free. Don’t miss so many of them. Here comes the summer night. And the whole wide world is whistling. Sunsets, like childhood, are viewed with wonder not just because they are beautiful but because they are fleeting. Many things in life can wait, but the sunset won’t; watch one tonight. A sunset should never go unnoticed. If the skies fall, one may hope to catch larks. We all see the same sunset. To the nights we dream about all winter long. The sky has changed from orange to a hundred shades of pink to a dark navy blue, and here I am still loving you. I’d like to just get one of those pink clouds and put you in it and push you around. Somewhere between earth and heaven. She was in love with the sunset. No one else ever even stood a chance. We hope that you like the collection of Sunset Instagram captions. Share this article with your friends and family along with this captions. We have also shared below amazing posts. Read them also. Copyright © 2019 | Best Good Instagram Captions | All Logos & Trademarks Belongs to Their Respective Owners.